This new retro style lightning detector is an updated model of the portable unit we produced 20 years ago! 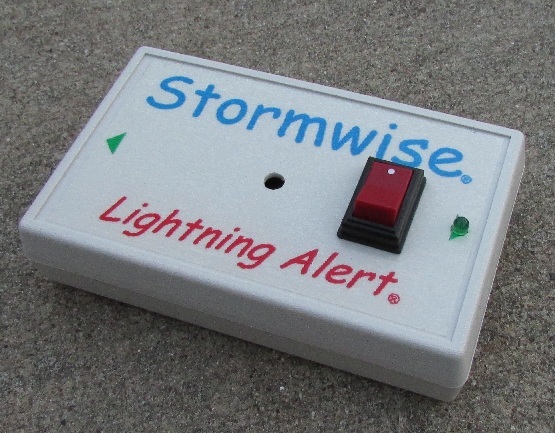 We've brought back and improved the Portable Lightning Alert Lightning Detector that we first produced back in 1998! CLICK HERE TO SEE A VIDEO OF THIS DETECTOR IN ACTION! The portable Model LD-3001 lightning detector gives you early warning of approaching thunderstorms and severe thunderstorms over 300 miles away! No other portable lightning detector has the extended range like this one! 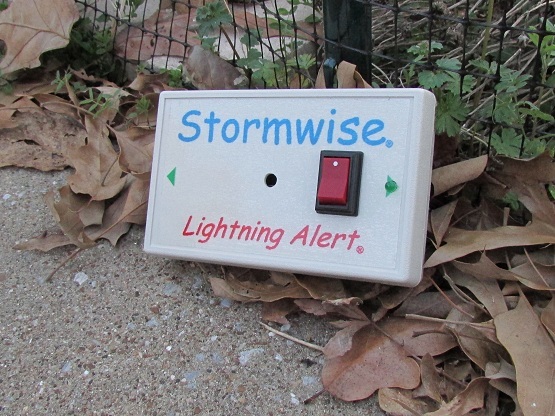 This lightning detector alerts you to lightning flashes over 300 miles away. It makes a clicking sound for each detected lightning flash. The long range is important for detection of severe thunderstorms. Distant flashes make single click sounds and the light blinks once. As the storms get stronger and closer more clicks sound and the light blinks several times each flash. Severe thunderstorms will make hundreds of clicks per minute! The detector is like a geiger counter for detecting thunderstorms! The closer and stronger the storms, the more clicking sounds! No complicated setup, or screen menu's to scroll thru. Just turn it ON is all you do. Simple. Powered by one 9 volt battery for up to 6 months of continuous 24/7 use. No outdoor sensor! Its all self-contained just like the original one we produced back in 1998. This detector makes a clicking sound and blinks a green LED light for each lightning strike detected. The closer and stronger the thunderstorms, the more clicking sounds the unit will make! Super long range detection of dangerous lightning strikes. Alarm makes a CLICK sound for each detected lightning flash. Green LED light blinks for each detected lightning flash. Works indoors, no outdoor sensors. Fully portable! Detects the type of lightning associated with severe thunderstorms at long range. Over 300 miles detection range for early warning of approaching severe weather fronts. Bi-Directional sensor pattern allows you to locate the direction of distant severe storms. Data logger output allows you to graph lightning activity with your computer using any voltage data logger. Stable operation: Detection range does not decrease as battery gets low. Battery and alarm test BEEP when first powered ON. No low battery feature. Designed to use the maximum service life of the battery. Works down to 4 volts. Stands up on desk or table, supplied with removable stand up plug jack. Range is adjustable: Positioned vertical you get over 300 miles range. Tilt off vertical to decrease the range. Uses one standard 9-volt battery for up to 6 months of constant use. Severe thunderstorms capable of producing high winds, large hail, and violent tornadoes usually (but not always) have powerful lightning flashes at some point in the storm's development. The detector can make hundreds or thousands of clicks per minute when severe thunderstorms with intense lightning are approaching. The LD-3001 Super Long Range Lightning Detector is $ 200.00 + $ 20.00 s/h US MAIL. Requires one standard 9-volt battery for up to 6 months of constant 24/7 use. This detector features more than 300 miles detection range so you can monitor severe thunderstorms at a great distance. The more "CLICKS", the stronger the storms. The LD-3001's over 300 miles detection range can give you several hours warning of very fast moving severe thunderstorms associated with weather fronts. Rotate the unit to find the direction of distant intense thunderstorms. The clicking sound will increase when the arrow-marked sides of the unit are pointing to the center of the distant severe storm. The severe storm is in one of two possible directions. Data Logger Output Jack on the back for connecting to any data logger capable of measuring DC voltage between 1 to 7 volts. 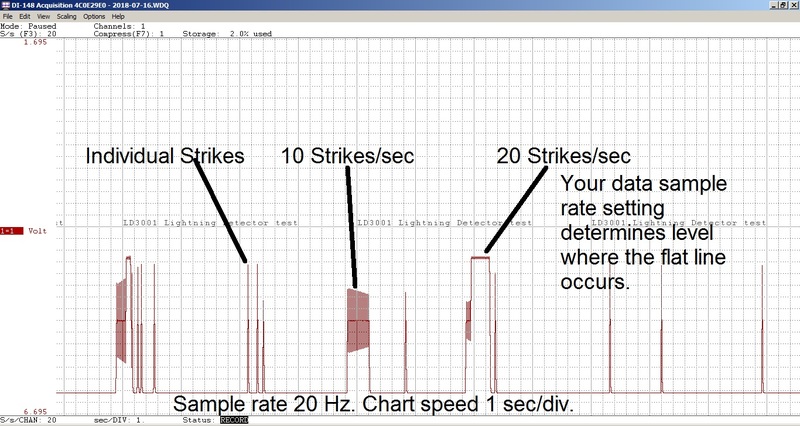 Use a PC data logger ( find at: www.dataq.com ) to automatically make a permanent chart recording of lightning storms and view the strikes on the chart graph in real time. The DC voltage level on the unit's output jack drops fdown for each detected event, in relation to signal strength and flash rate. A data logger can be used to graph this voltage level over a time period. The chart below shows how the individual strikes turn darker and closer together as the storms grow stronger. The chart below shows how individual lightning flashes look, compared to 10 flashes and 20 flashes per second. You can see how the very strong strikes lift off the baseline. The detector can resolve 100 flashes per second. 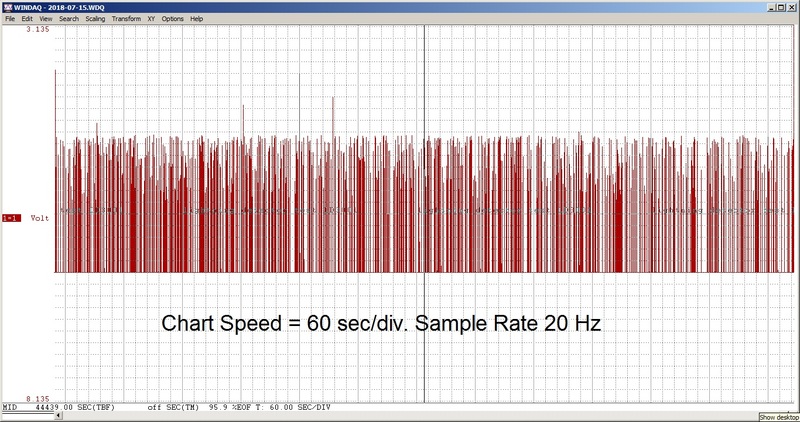 This chart was recorded only at 20 samples per second, however, which gives a flat line at 20 strikes per second.